People usually look for innovative home decorating ideas. But, at the same time, they feel the urge of being a little closer to nature. With the pollution around us gradually increasing, it is obviously a better idea to stay as close to nature as possible. It is quite impossible to stay anywhere near a forest and attend your workplace. Therefore, you need to think smart in order to avail yourself a natural way of living. How about customizing your home while giving it a natural look? Doesn’t it sound great? Bamboo can help you accomplish this task. With time, the demand for bamboo decor along with bamboo accessories is increasing rapidly. So, if you are interested in home renovation or add a fresh new look to the rooms, bamboo can be of great help to you. The first thing that comes in mind after hearing the term bamboo home decoration is the traditional Asian houses with various accents of bamboo around it. 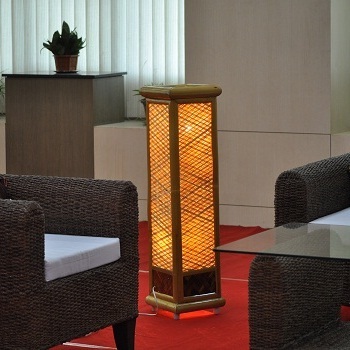 Many people would think of it as an absurd idea but, with the rising rate in people craving for a piece of nature within their house, bamboo home decoration can add a great amount of elegance to your house. Recently, the market has experienced a great demand for the traditional materials when it comes to the purpose of home decoration. Many people are opting for bamboo in order to create furniture, garnishes, window applications, flooring, and even curtains from it. There are many effective ways in which one can use bamboo to decorate their home for a natural yet elegant look. Wall decoration will be nothing like before if you add bamboo to it. The wall sides can be easily covered with various kinds of bamboo applications that are available in the market. This is one of the smartest ideas to save a lot of your money without wasting them on various paints. Moreover, the guests will definitely have a reason to appreciate your rooms. But, the room should have the appropriate size and accessories if you are planning for bamboo wall sides. Therefore, if you think that the walls would look better with paints on them, remove the idea of bamboo from your mind. Instead, go for various handicrafts manufactured from bamboo like wall hangings, curtains, photo frames – a few to be named. This is a very popular option in most of the tropical as well as sub-tropical areas. 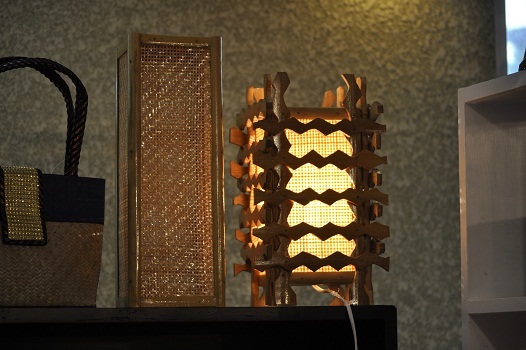 Furniture made of bamboo is available in various designs and can probably meet the taste of almost any individual. 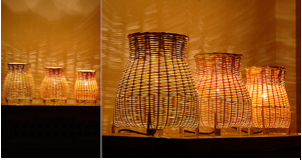 Moreover, they can increase the beauty of your room like never before. If you make a quick search online, you can find a local market filled with a wide range of bamboo accessories that go well with almost any kind of environment. From vases to show pieces, curtains to bowls, you can find almost anything to enhance your home beauty. 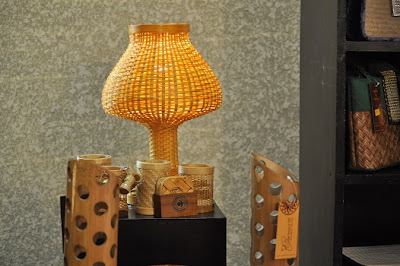 Therefore, choose bamboo as the main component of your home decor accessories and live as close to nature as possible. Decorating your home can be fun if you add some innovative ideas to the accessories. Bamboo has emerged as one of the greatest components for home decoration that can also provide your home with a natural look. Author’s Bio: James Patrick is an absolutely proficient author. He loves to write on various Home Decoration topics and contributes them to Finelineconstruction.net in Charlotte, NC. Summary: Many people want their room to have a natural and fresh look. At the same time, they want their room to be elegant. All these purposes can be served if bamboo home décor accessories are used. I started KraftInn with very little capital and with help from family and friends. It has been an incredible journey and though I still dont have any fixed salary or income for myself, I have been able to hire six incredible people - five of them artisans and one of them a painter, a man of great jugaad and a great smile. Hiring is a great responsibility in itself especially when you are looking for people who have families to take care of, have a limited education and are not as spoilt for choices as graduates or engineers. Regardless of the struggles of the company and with a little help from family and friends, I tried my best and has been successful in paying for their salaries on time and provide for their accommodation - Some of them have never been out of their villages. Now, we are at a phase, where I have started looking for talent of a different sort - creative people like designers, for accounting and customer service. We are based in a very small town, so it works both ways - its difficult to find talent and at the same time, there are people who find it difficult to find jobs. 1) Integrity : I would rather prefer an employee with limited talent and exceptional integrity rather than the other way round. 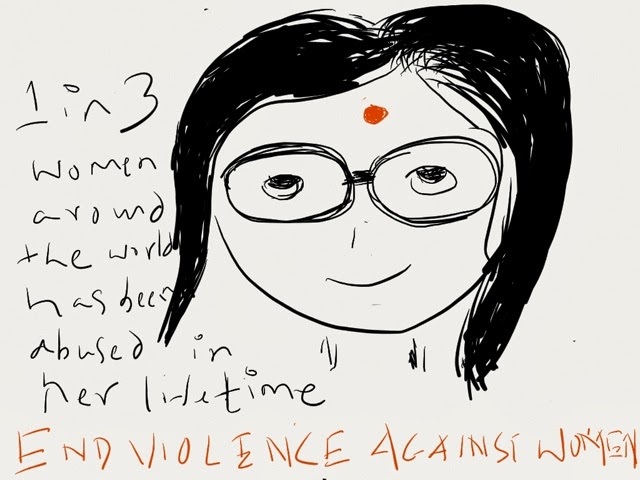 2) Relatives : I am a bit confused on this one. When you are very small as a company, it is incredibly difficult to attract talent so one way is to find people who are relatives and looking for work and work out a mutual benefit thing. I just think it may get a bit complicated so I have skipped on this one. 3) Friends : When you start up, you have a host of friends who encourage you and some of them may just be bored with their jobs and looking for that opportunity. Since you know them for long, you know traits about them and hidden talents which most other companies may not have found. Once I am ready to offer something substantial - a reasonable package or equity, this is definitely something that I look at. 4) Interviewing : I look out for resumes and interview people but this one is time taking and sometimes it takes a while to find the right candidate and that works out for everyone. Let me know if you faced any of these. It will be cool to know what other startups, especially with low capital and a techno-functional businesses are doing this. I have been an entrepreneur for the last three years. It has been a roller coaster ride and I have made some very common mistakes. I sometimes wish I didnt make them or somebody could have advised me. So just sharing if it is useful for you. No matter how smart you are, you will always need to pass some of the things to others. You cant do all by yourself. It is important to understand your core competence and let other people do things that they are good at - it may be a colleague or outsourced or maybe it can just wait. 'Inventory or Marketplace ? ', this is one of the pertinent questions of our times in the context of ecommerce. While the inventory model means that the ecommerce site has to carry inventory of all products it sells, the marketplace model requires the ecommerce site to act as a exchange platform between buyers and sellers and it charges a commission. The upside of a inventory model is faster delivery times and a consistent customer experience while this also means higher inventory and supply chain costs. 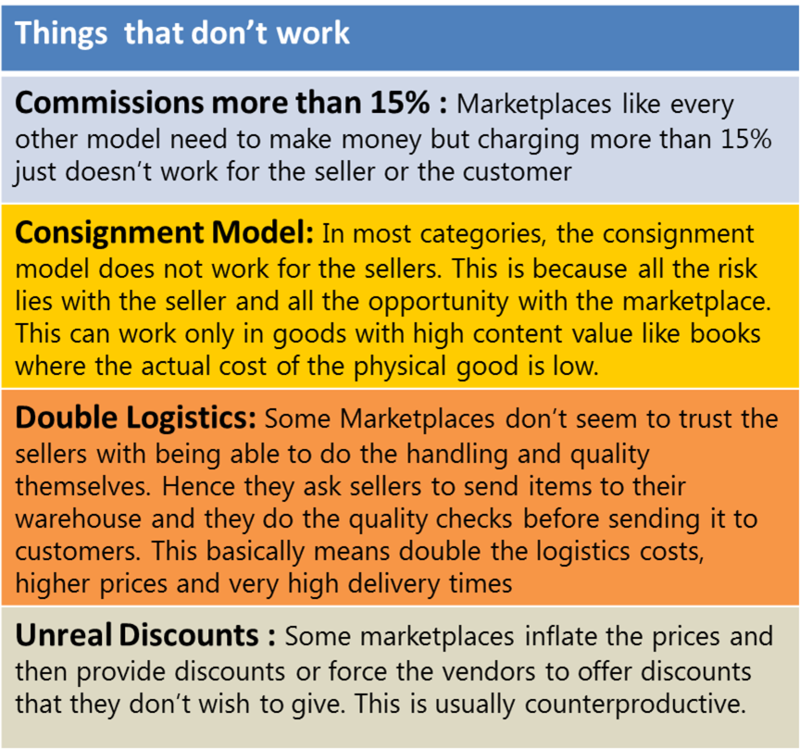 The marketplace model shift most of the inventory risks and costs to the sellers but it becomes a continuous challenge to manage seller and buyer expectation in a consistent and fair manner. 2) Efficient Delivery - Getting orders delivered in reasonable time is important for ecommerce. 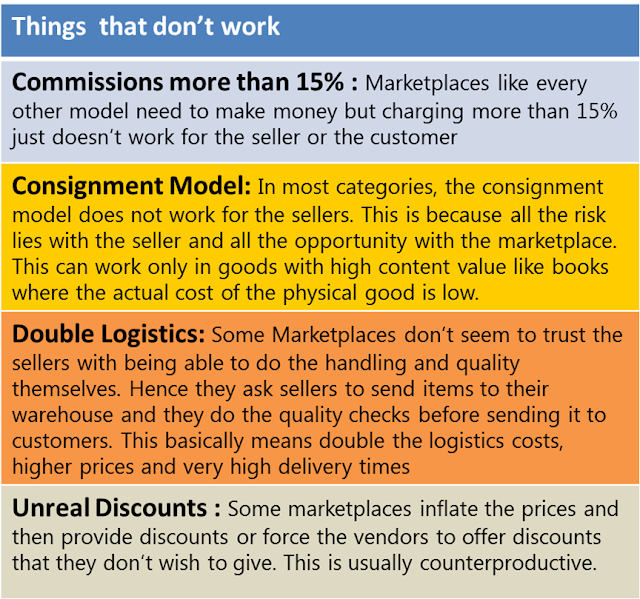 While for inventory based models, this is about managing inventory efficiently, for marketplaces, this is about not overdoing checkpoints and reducing unnecessary logistics costs. 3) Customer Management - Though customer service is paramount, it is worthwhile to remember that there are segments of customers that are still not ready for Ecommerce. 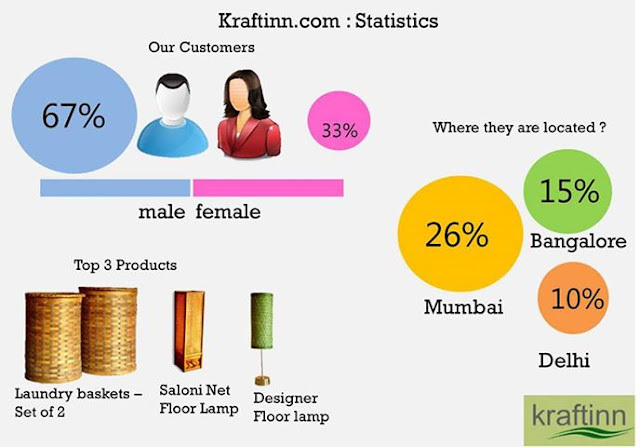 At KraftInn, we have had some experience in both models - We use the inventory model for our website -www.kraftinn.com while we participate in the marketplace model in marketplaces like Ebay as a seller. 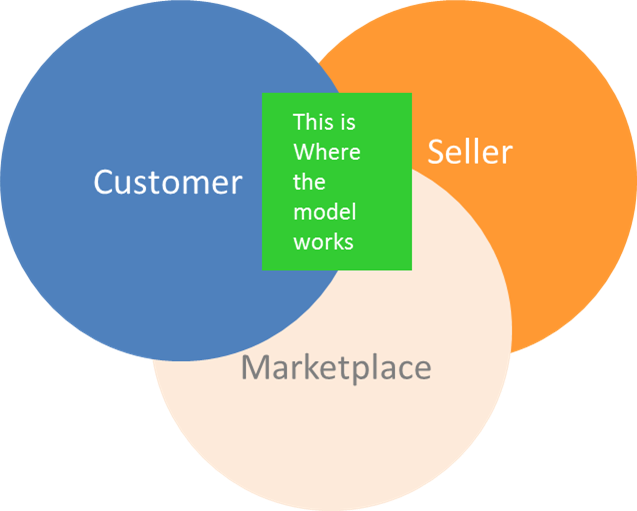 There are three key stakeholders in a marketplace model and it is important to get the right balance between the three. Will the internet kill all large traditional businesses ? The other day, I dropped by Coffee Day(indian coffee chain - startbucks equivalent). Adjacent to it was the well loved Crossword store and I clearly remember that there was a connecting glass door somewhere which let people who had come for coffee to stroll by and look up books and dvds and vice versa. I could see some books lying about but the place looked empty and the glass door seem to have vanished. So, I casually asked the Coffee day guy and he told me something to the effect that the place was shutting down. It was kind of a gentle shock for me and though I could hardly remember buying a book from Crossword, hanging about in bookshops has been one of the idle pleasures of urban life.Then it struck me, that though I dont read a lot these days, there was a time I spent a couple of thousand rupees on books every month and most of it was at Crosswords. In the last six months, that spend had got diverted to online stores like flipkart and in many cases I could just read for free - flipboard etc. I have no idea whether the store actually closed down due to business reasons or whether it was just a phase of temporary shutdown due to renovation etc but like in the US, book businesses everywhere seem to be facing major challenges and most if not all is due to the internet. 1) Email is free - only a decade or so ago, people used to send telegrams and pay per word. Its weird that a service that is many many times faster and reliable is actually cheaper - well not just cheaper, free. 2) There was a time only 15 years ago, when we used to attend book festivals to buy editions of Enclyclopedia for thousands of rupees. Now you just get a million times of that content for free. Also, searching this mammoth knowledge base again is free. 3) Music is basically free. If you are a music lover with generic tastes like most of us, gaana.com gives you almost everything you need - For free. 1) Book industry - Why would you buy a book if you can download it ? Traditional booksellers are just looking one way and that is down. 3) Post Office - The Indian Post office just stopped the telegraph service. Which ones will be next ? The movie industry, the retail industry , enterprise software products. All this obviously means that if someone is losing out, someone must be winning. So who should be the winners, obviously the internet companies - but if you look a bit closer at the internet companies, if you leave out the leaders, most are struggling to make money...Giving things free actually costs money, giving discounts actually cost money. The internet can be a democratic force giving the small guy a chance to compete but it has probably made the race so competitive that its a race towards the bottom and may kill a lot of industries in its run and maybe hurt itself on its way. The good part is you dont need a license to join the race. If you are a handicraft afficionado, you must have surely come across the delightful website shopo.in. Today it announced that it has been acquired by Snapdeal.com. Its not exactly clear what direction it will take, whether the website will completely shut down or whether sellers goods will be made available at the Snapdeal website. 2) 15% Commission : India is a very difficult market and it is important that products are priced right. Another important part it should make sense for the whole ecosystem for products to be sold and customers to be happy - this means designers and manufacturers get to sell at a price that is good for them, marketplaces get a sensible commission and customers get a reasonable deal. Many players dont get that and want to charge 30%-40% which simply breaks the system. Shopo went ahead and fixed it at 15% with no listing fees - which was just great for everyone. 3) From Designer/Manufacturer to Seller - There are a lot of ecommerce stores that neither want to become a pure marketplace nor carry inventory. They get an order, place it to the manufacturer and then get in their warehouses, package it again and send to customer. This is a bit ridiculous because 1) Higher chances of stock out 2) High delivery times and low customer satisfaction 3) Double the cost of packaging and higher chances of breakage 4) Higher price. However, Shopo did not fall into that trap and instead focused on enabling the seller (pickups from Fedex etc) rather than become an unwanted gateway in between. 1) Logistics - If you are a seller, you can either ship it yourself or get Shopo to pick up the order via its courier partners. 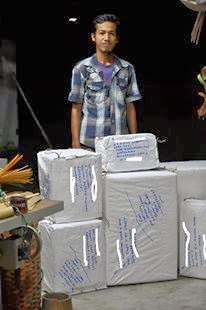 Though it was great for the seller and customer, I am sure this must be very expensive because it is difficult to estimate the size/volume of each product and probably it is best left for the seller to ship. 2) Marketing - Lately Shopo tried a form or marketing using which Sellers could market their stuff at Shopo's facebook page etc for a price. This is a bit strange for sellers because they are anyway paying 15% as commissions which should include marketing and payment etc. 3) Technology - Though most of what they did in terms of technology - feeds or the iPad app were really cool, the site was a bit slow at times and as a seller, your products kind of got lost as new and new sellers joined - somehow it felt that relevance and popularity lost out a bit to how new your stuff was. Overall, Shopo was like a breath of fresh air and hopefully, these kind of services/websites dont lose their relevance when acquired by the big boys. Best of luck to the Shopo team - you guys have been awesome. 1) Videos : It is widely accepted that videos play an important role when it comes to search engine optimization. They are crawled and indexed easily though we have not been able to determine how it affects the number of queries. Creating a compelling video is hard work - no video is better than a patchy video. Videos also take significant bandwidth which means two things - 1) higher storage costs and 2) requires a good connection for the end user - it is possible that you may have a wonderful video and 90% of your customer base can't get your page to load properly because they have a slow connection. Our experience with video has been very mixed. There is no significant increase or decrease in product conversions due to videos. So we are taking it a bit slow when it comes to video - about 10% of our products have videos. 2) Mobile : Do we need a iPad add ? Do we need a iPhone or Android app? The answer at this moment for us is no. This is basically because there seems to be a lot of reluctance in india to use credit cards online so extending that, we believe that using them on a mobile app will be a bit more complicated - also payment gateway integration may not be seamless. The app strategy may be good in case of COD, but since we dont do COD, it looks like a lot of investment without returns at this point. Also with HTML5 and other things on the horizon, we believe the app thing may be a pasing fancy and a singular web based UI across device will start taking precedence in the future. 3) Google : Though we dont have a lot of insight into how Google works, it seems with the recent updates, Original content is becoming more and more important and the number of links especially bought links are kind of becoming less valuable. So, we have kind of stopped doing too much SEO jugglery and just put up good content when we have a new product. Traffic wise, our strategy hasnt worked very well, but at the moment we dont know of ingenous ways to build links and traffic from emails etc havent been very productive for us. 4) Social : Pinterest is not working for us in India - we get some repins etc from primarily US users, but dont seem people care much about pinterest much. Twitter brings in lot of instant traffic but cant seem to connect any conversions to twitter. We havent done much with linkedIn.Facebook is where we spend most of our social time. Our audience engagement has been pretty good and people usually respond well to smart and funny posts, pictures - e.g animals have good engagement. Our average is one post a day and anything more than two usually causes engagement rates to go down drastically. Social is great for brand building but from conversion perspective, it seems a bit overrated at this point. We may be wrong, but that has been our experience though getting accurate conversion data from facebook is very difficult. 5) Advertisement - We have an absolutely tiny budget for ads. The ROI is pretty poor but what you gotta do you gotta do. We do a little bit of google ads - only search and video, no banners. The conversion cost are very high and then some of them drop off during the payment. Video is primarily for branding - not sure if it is working - difficult to track. In Facebook, we primarily page post ads and spend about Rs 6-7 per like - Its not too bad but again it is more of a branding thing. In the times of ecommerce layoffs, people have started talking about something called as 'Idli Profitability'. Apparently, it is a take on 'Ramen Profitability' coined by Paul Graham and supposed to be a state where a company is supposed to generate enough money so that it can take care of its basic expenses like employee salaries and sustain the founders. 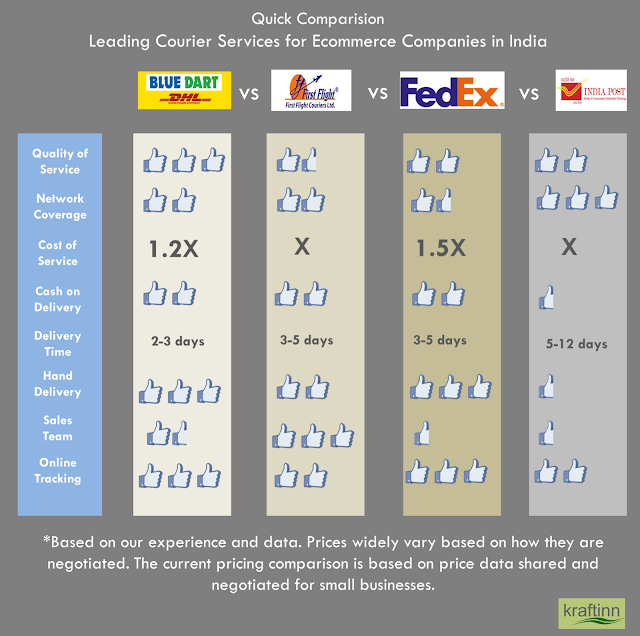 For a layman unaware of the crazy ride that ecommerce in india has become, it may be somewhat puzzling why this is even a question - every business should be do that - able to manage its expenses that is. However, Ecommerce in India is like big investment pot and too tempting for large investors to ignore even if most ecommerce websites even after 3-4 years have not even become 'idli profitable'. 1) Traffic is seldom created by brand value but often bought by advertisements. This broadly means generating traffic mostly by ads in Google(search, banner) and Facebook(mostly banner). An average click using an advertisement is roughly 10 Rupees(take a few rupees here and there). 50 clicks generate a sale. Do the math. Typically you end up spending 500 Rs for a sale (say average - 1500 Rupees). So 25% of your revenue will go as ad spend (considering you are able to generate 20% sales without ads). If you are mature ecommerce company, this percentage maybe lower but you may have probably burnt more money on TVads or in getting where you are. logistics but typically the commission is 15-20%. Inventory model : Money left :=100-40 (conservative estimate of 25 rupees of ads and 15 rupees of logistics) Typically it is difficult to sell an item at double the factory price so lets assume Cost of Goods as 60 Rs (in case of books it is reasonable to sell a 60 Rs book(from publisher) at 100 Rs after 10 percent discount to a customer but in other like electronics it may be a tricky affair). So essentially you are left with Rs 0 to pay for your salaries (100-40-60). MarketPlace model : Lets assume the comission charges as 15%. This means you end up with 15 Rupees for every 100 Rupees sale. So Money left := 15-25(ads cost). So ou are left with -10 Rs for your salaries. It is not hard to see why profitablity or even idli profitability is difficult if not impossible in such a scenario. There are obviously going to be exceptions who will reduce these costs either because of brand name or land grab but for majority of ecommerce players, its gonna be a long chase towards profitability. A lady called us yesterday and asked for discounts. We asked her if she was interested in any particular product and she said that she hadn't made up her mind but was wondering if there were any discounts. This is a common happening for us - every other day we get inquiries for discounts. We had toyed with the idea about discounts quite a few times and had done some experimentation around it. Unlike most other ecommerce retailers, we also manufacture or handcraft our own products in house. Following were some of the things that came into our mind. 1) Discount in the Overall Price : Suppose a product has been priced at 100 Rs and we give a discount of 20%, the price becomes 80 Rs. Why not give it at 80 Rs itself ? 3) Marketing Ploy : Indians love discounts and it is usually a great marketing ploy. However, consider the high customer acquisition costs, we think it is more important to get the trust of a customer for repeat purchases or referrals than trick him or her for a quick sale.